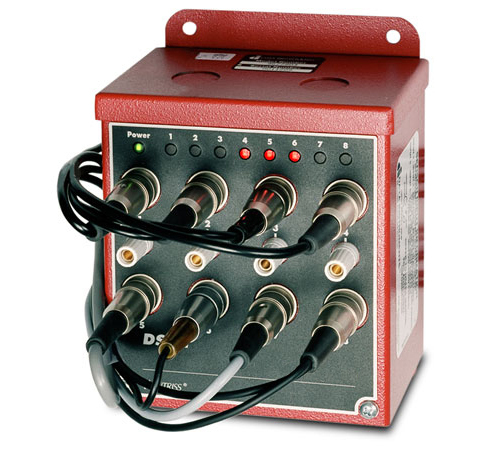 The DSI 2 is available with 8 or 16 sensor inputs, and features a built-in 24VDC power supply to power your sensors. The DSI 2 has built-in pulse stretching on inputs 1-4 (also on inputs 9-12 on 16-input units) to stretch very fast signals (usually from part ejection sensors) out to a duration of 10mSec. The DSI 2 is a flexible sensor connection solution. It is available with or without front- panel connectors for wiring individual sensors, along with a variety of larger connectors (including a heavy duty 19-pin M23 connector) for use with die-mounted junction boxes that allow you to connect up to eight sensors to the DSI with a single cable. Wintriss offers a complete line of sensors and connectivity products including proximity and photoelectric sensors, die-mountable junction boxes, cables, and connectors. The DSI 2 is compatible with all versions of SmartPAC 2, SmartPAC 1, and DiPro 1500.